Onchan School Go Club meets once a week at lunchtime. From there, you can continue with further exercises. Start at the beginning (50 kyu problems) and work down. Slow down if they start getting difficult. Catch-up on initial introduction for students who joined later. 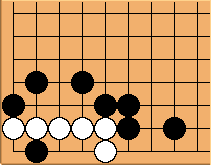 Nice introduction to 9x9 go and capturing stones. Comic introduction: online version of the little booklet given out in class. Recommended server: KGS (needs Java). Play human opponents online and chat by typing. You can play using a browser, but download the client if you plan to use it a lot.